We love pasta, but we hate what it does it Rhodes’ blood sugar. Unless he’s getting ready to run a 10K, we avoid a pasta-heavy meal. Make your noodles count. Try to avoid regular old white pasta. Look for whole wheat pasta that at least adds fiber. 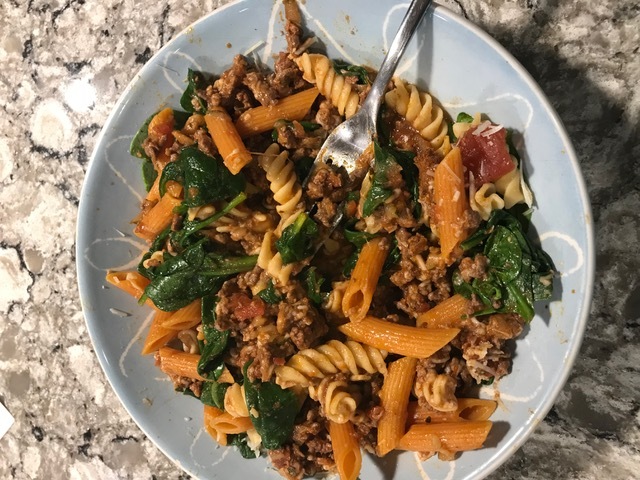 Or better yet, look for pasta made from veggies or beans, like chick pea pasta or edamame pasta that has more protein and less carbs per serving. Don’t add unnecessary carbs with the sauce. We look for low-carb pasta sauce (5 or fewer grams of carbs per serving). A lot of sauces have unnecessary sugar added. Trust us, you don’t need carbs for good tasting marinara. Replace 1/2 the pasta in your bowl with veggies and protein. Add sautéed ground beef or turkey, shreds of chicken or pork to your sauce, then substitute some of the pasta for veggies. We like to add spinach or zucchini for nutritious greens and added fiber. Not convinced? Try this recipe and you’ll change your mind! Boil Your Pasta (I used chick pea rotini by Banza and Whole Grain Penne by Barilla). If you like spaghetti and want low-carb pasta, try Explore Cuisine’s Edamame Spaghetti, but beware the texture and taste is a little different. A recommended serving is 2 oz dry pasta, which equals about 1 cup cooked pasta. Try to use a little less than a cup of cooked pasta per person and fill your bowl with other things. Put 1 cup of washed and dry raw spinach in each bowl. Spoon about 3/4 to 1 cup strained, still-hot pasta on top of the spinach. Then cover with about 2/3 cup your meat/zucchini sauce mix. The heat from the pasta and noodles will wilt your spinach in seconds. Toss it together with a fork and sprinkle on a little parmesan cheese. I estimated this dinner was about 45 carbs with a whopping 30 grams of protein and 10 grams of fiber.